GORHAM — Three years ago, as a ninth-grader at Gorham High, Mackenzie Holmes had a pretty good idea that one day she could play Division I basketball in college. Already, college coaches had sent her letters of interest, and the University of New Hampshire even offered a scholarship. For Jason Montano, the idea of competing in college came even earlier. At age 5, he marched into the living room and announced to his parents he would be a Division I athlete. On Wednesday, Holmes and Montano formally accepted full athletic scholarships to major universities in the Midwest. Holmes will play basketball at Indiana, and Montano, the reigning New England shot put champion from Thornton Academy, will throw for DePaul in Chicago. 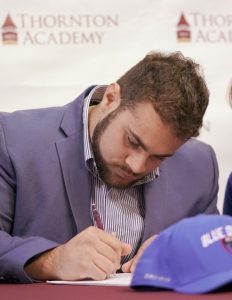 Joining Montano for a signing ceremony Wednesday morning at Thornton Academy were more than 100 friends, family members, faculty and four other seniors who scrawled their signatures on a national letter of intent to accept full or partial athletic scholarships offered by NCAA institutions in Division I or II. The scene was repeated in the gymnasium at Gorham, where roughly five dozen folks gathered to celebrate Holmes, including nine of her Firecrackers AAU teammates who attend other high schools. Holmes and Montano were among more than a dozen high school seniors from Maine who signed – or will soon sign – scholarship offers from Division I or II colleges, which, unlike their counterparts in Division III, can offer aid based on athletic ability. The letter binds student and institution. The student agrees to take a full course load for at least one year, and in return, the school takes care of all or part of the cost of attendance. The cost of attendance for a year at DePaul is roughly $56,000. For Indiana, it’s just under $50,000. Both Montano and Holmes said they are accepting full scholarships. Wednesday marked the initial signing date for all sports except football, whose window opens Dec. 19. Division I basketball recruits have one week to sign during the early period; their window reopens April 17. Among the Maine seniors who signed Wednesday or are expected to sign within the next week are Thornton Academy’s Cat Henaire (Merrimack field hockey), C.J. LaBreck (Monmouth lacrosse) and Thomas Levasseur (Georgian Court lacrosse); Falmouth’s Doug Cooke (Lehigh track and field), Caitlyn Camelio (Michigan lacrosse) and Riley Reed (Merrimack lacrosse); Massabesic’s McKenzy Ouellette (St. Anselm basketball) and Skylar Renaud (Southern New Hampshire lacrosse); Greely’s Anna DeWolfe (Fordham basketball) and Rachel Smith (Merrimack golf); Cheverus’ Sophia Pompeo (Providence field hockey), Bella Booth (Bentley field hockey) and Justin Ray (Assumption baseball); Kennebunk’s Derek Smith (Bryant baseball), Christine Jarowicz (Franklin Pierce field hockey) and Evan Schindler (St. Michael’s lacrosse), and Boothbay’s Faith Blethen (George Washington basketball). Holmes won’t be alone in Indiana. Her older brother, Cameron, 20, accompanied her last fall on her official visit to the Bloomington campus.